Welcome to the first post in our series explaining the basics of the Zen categorization system for logic games. Click here for a broad overview of the logic games system. Today, though, I'm going to focus on tree rules: what they are, how to recognize them, how to diagram them, and detail their interactions with a few other rule types. Tree rules occur in the context of a sequencing game, where the game revolves around the order in which different actors appear. Examples include games based on races, rankings, or prioritizing to-do lists. A tree rule describes the relative order in which at least two actors or groups are sequenced. Common examples are "A appears before C," or "C appears after A." Both would be diagrammed like the example on the right, as they mean the same thing. 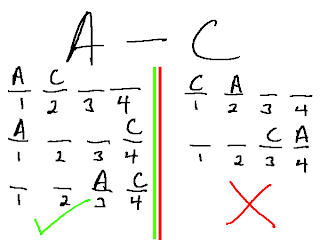 Note that on its own, a tree rule doesn't tell you where in the sequence the actors must fall, just their relative position; in the example on the right, A could be in 1, 2, or 3, as long as C appeared somewhere after it. Compare this rule interaction to Slots, Barriers, and Together rules once I post about those. 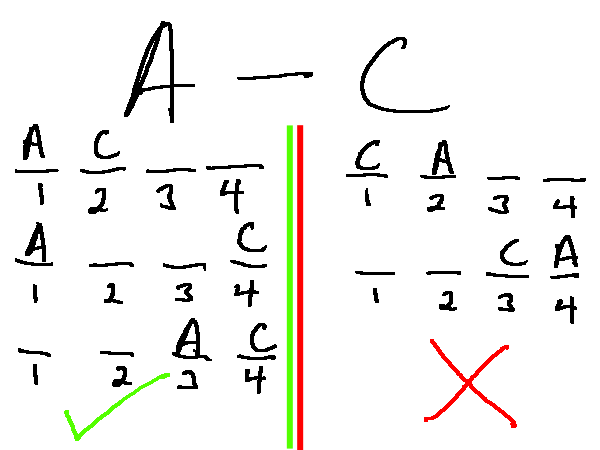 Importantly, the only time A and C have to be next to each other is when we know that A is in 3. Can you explain why? If not, look ahead to our discussion of min and max relating to tree rules! 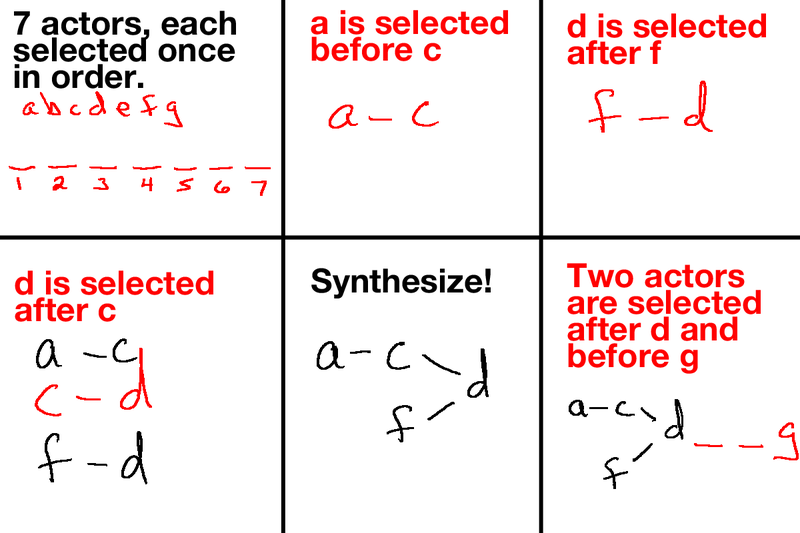 Here is an example breakdown of how a series of tree rules combine to create a "tree" of events. The first panel is a summary of an example LG stimulus that would let you know you have a sequencing game. 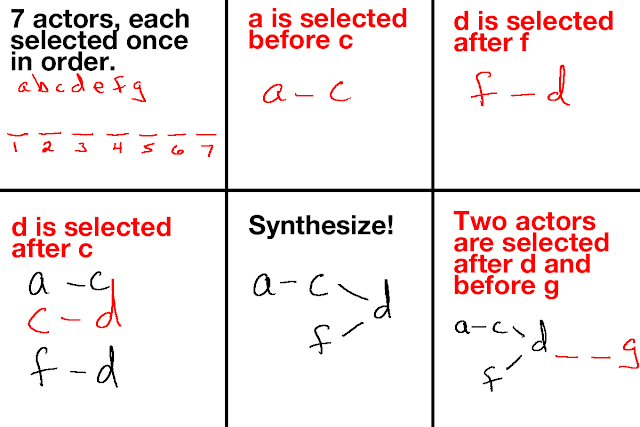 The following panels present new rules (in red) and how they should be diagrammed (in red). Always be on the lookout for ways to synthesize, or combine, the rules into a single tree, as that makes recognizing important parts of the game much easier. Do we know anything about the relative order between A and F? Only that both must appear somewhere before D. A could appear before or after F.
Same as above. C and F don't have any rules or deductions that tell us which must come before or after the other. F must come before G. Visually you can see this because there's a "line" connecting F to D, then two blank slots, to G. Logically, you can say: D must come before G and F must come before D, thus F must also have to come before G.
Where are you going to find these tree rules? 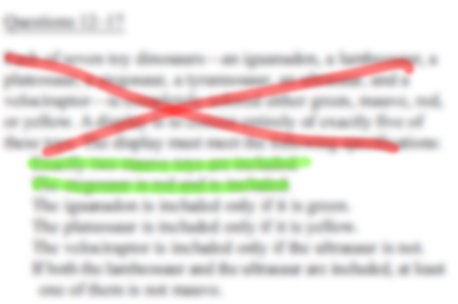 Tree rules are never contained in the game's stimulus, instead appearing in the list following the stimulus. They almost always travel in packs, so be prepared to combine your multiple "saprolings" into a single "tree." Finally, let's talk about MMFR (min, max, free and restricted) in relation to tree rules. Thinking about MMFR will help you focus on the most important parts of logic games, and reliably lead you to the "aha" moment when your diagram becomes much easier to use. In the game above, we had two actors with no rules, B and E. By definition, then, these two actors are our "least restricted." We have no information about where they must go, although other rule interactions could (and indeed do) restrict their placement. Recognizing your most restrictive actors is fairly easy in tree diagrams, as they will be the actors with the most chains leading to and from them. Pulling from the above example, both D and G have six slots that we know must come either before (in the case of G) or before and after (3 each, in the case of D). The diagram below utilizes both of these issues and combines the min/max information from the stimulus--that there are only 7 available slots--to draw our most restricted actors from our tree diagram into the slots they must fill in the slot diagram. 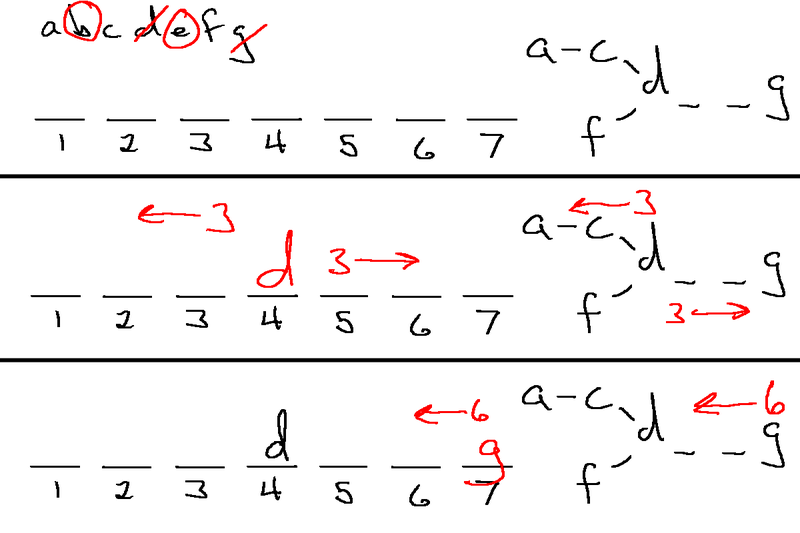 In the second panel, D must have three actors before it (some order of A, C, and F), and three actors after it (two unknowns and then G). The only slot where D can have 3 actors both before and after it is the fourth slot, so we can go ahead and draw that deduction into the diagram. 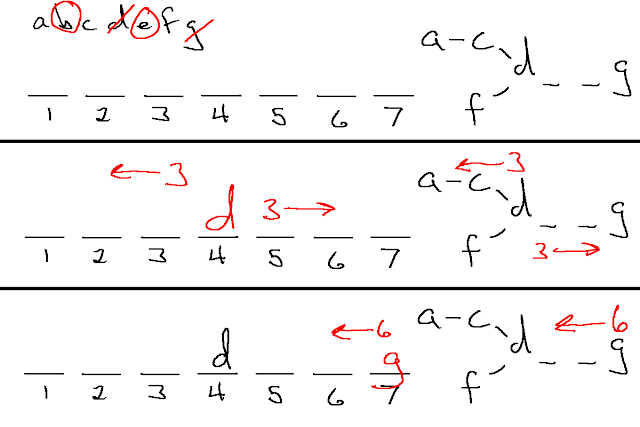 Similarly, and depicted in the third panel, G must have 6 actors appear before it: some order of A, C, F, and D, along with the two other actors. Only the seventh slot has six spaces before it, so G can be drawn in there. What about our "free actors?" Where could they go? Is there space for them before D? Not with three spots and A, C, and F having to fit into them. After D? But there are only two spots! Maybe they're not so "free" after all... Welcome to logic games.